There is no doubt that the iPad is a groundbreaking device. There may be a host of other tablets in the market today, but the release of the first generation iPad changed how we use mobile devices in a huge way. There are many applications for the iPad. Some find it the best tool for children to learn. Some find it a great way to play games. Others use it to augment their array of devices for work. However way you use the iPad, you might agree that one thing is missing from the picture: the ease of typing using the on-screen keyboard. Truth be told, the virtual keyboard does not take long to get used to. After all, the iPad keyboard is very responsive, and after using it for a while, you do not really have reason to complain about it. Then again, if you are a touch typist, and you like doing other things (such as watching TV or a movie) while typing away on your device, you might feel the hankering for a keyboard that you can use with more ease. That’s where this new iPad accessory comes in very handy. Called TouchFire, this keyboard is a Kickstarter project that has received successful funding recently. 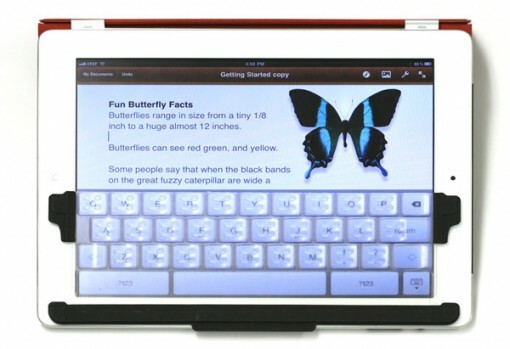 The idea is simple: a soft, transparent keyboard that you can put on the screen of the iPad. I haven’t used TouchFire myself, but I suppose that it might be similar to the keyboard protectors that one can buy for all sorts of laptops. I do realize, however, the potential that such an iPad accessory has. Another advantage of TouchFire is that you can use it with both the iPad and the iPad 2. Now, we will have to see if it will work with the iPad 3, which they say is in the production stage as well. Also, TouchFire is compatible with a host of international keyboards, ensuring that you can use it no matter what language you use. You can reserve your TouchFire keyboard for the iPad and iPad 2 now via their web site. Unfortunately, you won’t be able to get your hands on one before Christmas as the first batch sold out rather quickly!